Norwegian domestic intelligence chief Janne Kristiansen has told the BBC no evidence has so far been found linking Anders Behring Breivik with far-right extremists in Norway or elsewhere. Mr Breivik admits Friday's bomb and gun attacks that killed at least 76 people. He says he is part of a wider movement and has written about UK contacts. But Ms Kristiansen said she thought he had acted completely on his own. She also cast doubt on suggestions by Mr Breivik's lawyer that he was insane. The bomb in the capital Oslo targeted buildings connected to Norway's Labour government, while the mass shooting occurred at an annual Labour Party youth camp on a small island, Utoeya. Media captionJanne Kristiansen: "So far we don't have any evidence of cells in Britain or in Norway"
Ms Kristiansen, who heads Norway's Police Security Service, told the BBC: "We don't have indications that he has been part of a broader movement or that he has been in connection with other cells or that there are other cells." But she added that the possible existence of accomplices was being investigated. "I don't think there is any limits to the evil in this person's head," she said. "We can't take any chance with this person." About contacts with right-wing activists in the UK or other countries, she said: "We are in close contact with our sister services in Europe, America and elsewhere." Denying suggestions that Mr Breivik was insane, Ms Kristiansen described him as calculating and someone who sought the limelight. The lawyer, Geir Lippestad, said it was too early to say if his client would plead insanity, even though "this whole case indicated that he is insane". "He believes that he's in a war and he believes that when you're in a war you can do things like that without pleading guilty," Mr Lippestad said on Tuesday. In her BBC interview, Ms Kristiansen also defended the actions of Norwegian police - who have been criticised for taking 90 minutes to get to Utoeya after the shooting began. She said the island was "quite a way away" from Oslo, and that officers had got there as quickly as they could. The leader of Norway's Delta Force, a special-operations unit, said the breakdown of a police boat did not cause any significant delay. Anders Snortheimsmoen told reporters that the team had immediately found an alternative boat to reach Utoeya. 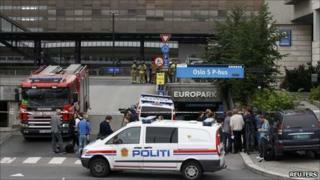 Early on Wednesday, parts of Oslo's central station were briefly evacuated after a suitcase was left on a bus. Police later said nothing suspicious had been found in it. Obsessed with "Islamisation of western Europe"
Meanwhile police say they have detonated a cache of explosives found at a farm north of Oslo which Mr Breivik had rented. Friday's massacre prompted up to a quarter of a million people to take to the streets of Oslo on Monday to commemorate the victims. The names and addresses of the first four confirmed victims were published on Tuesday on the Norwegian police's website.